Senate President, Bukola Saraki, has commended persons he described as “the leadership of respected voices of Nigeria’s ethnic nationalities” for endorsing the presidential candidate of the Peoples Democratic Party, Alhaji Atiku Abubakar. He described the regional leaders’ endorsement as an incontrovertible validation of the scientific polls by the London Economist intelligence unit and the William and Associate team. Saraki, who is the director-general of the PDP Presidential Campaign Council, also described the results of the scientific polls as the true reflections of the wish of the electorate. The Senate President in a statement issued in Abuja said that with the latest developments, Nigerians had taken a position that the false claim of integrity and anti-corruption fight by President Muhammadu Buhari was nothing but an election gimmick. “The economy has been thoroughly mismanaged. Insecurity has become more widespread and beyond their control, while the government encourages and nurtures corruption from within,” he stated. 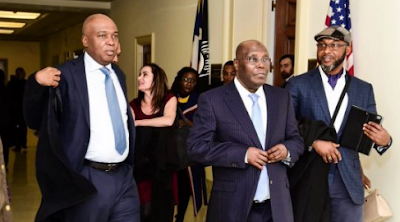 He also expressed confidence that Atiku would win the election in a free-and-fair contest based on the scientific forecasts by the two groups and the support for Atiku by the electorate. Saraki urged Nigerians to take a cue from the gale of endorsements and predictions by credible groups in favour of Atiku and vote wisely. He said, “The endorsements are like tonic to the work of the campaign organisations to intensify our efforts as it is a testament that we are employing the right approach and techniques to market our candidate to Nigerians. “We have been able to change the narratives. We have debunked a lot of lies and rumours being peddled around against our candidate and Nigerians are now better informed.